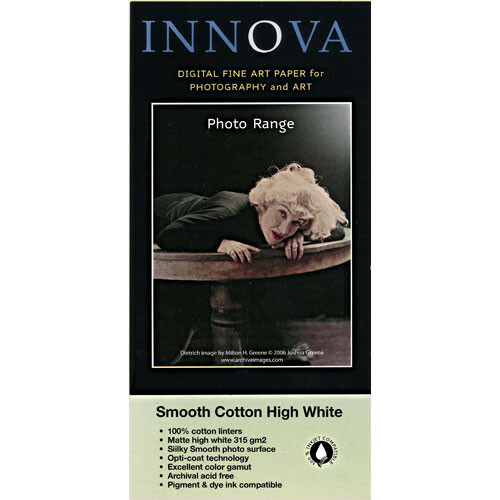 Innova Smooth Cotton High White Paper has a silky smooth surface structure that has been designed to provide the natural characteristics of a smooth high-white art paper with the natural aesthetics demanded by artists. The surface has a special matte coating designed for high quality fine art & photographic reproduction. It is also excellent for photo restoration print applications using inkjet technology. The Smooth Cotton High White Paper is made from 100% cotton, is acid free, and features excellent color gamut representation with superb color accuracy. This archival quality paper is compatible with both dye-based and pigment-based inks. Box Dimensions (LxWxH) 17.2 x 11.0 x 0.5"